Our FREE trading platform is the cornerstone of our customer offering. We are constantly looking to improve our offering to include as much free information and tools as possible to make your trading decisions easier. The JMI Brokers Trader allows you to trade from a streaming quote feed using advanced technical analysis tools, and all in real time. This is the JMI Brokers MT4 Trader program window. The windows are anchored to each other by default but you can manipulate them in a variety of ways. Most windows are easily positioned anywhere on the screen. The Market Watch window, also referred to as the Quotes Window, is a floating palette. You can drag it anywhere on the screen (even over other windows). You can toggle through the Market Watch window item by using the menu items View > Market Watch or by pressing the Ctrl + M key combination. The Market Watch button on the toolbar also shows or hides the Market Watch window. The Market Watch shows current prices of the traded currency pairs and also allows you to make quick transactions on any currency pair. To initiate a trade, double click the selected vehicle and the Order Form will open up. You can also access the Order Form by right-clicking your chosen currency pair and then choosing New Order. 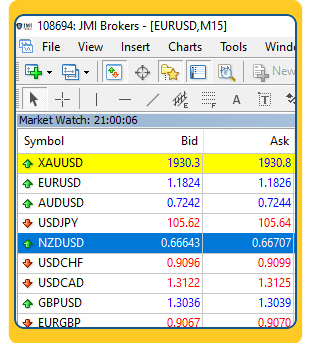 - Right click the Market Watch window to add or remove currency pairs from your list, or to show High/Low and Time. - Or clicking on the New Chart button on the toolbar. Each chart is highly customizable. Charts can be manipulated to appear in many different ways. 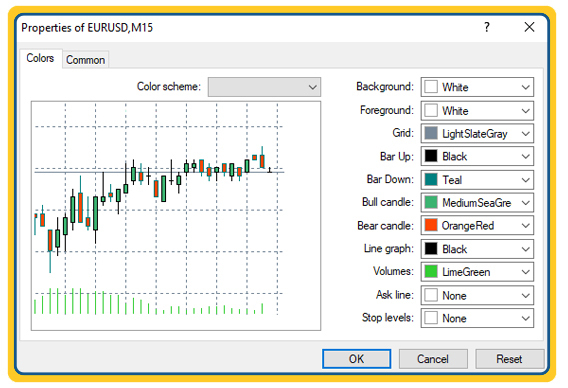 Choose from three chart styles; Candlestick, Bar Chart or Line . Easily apply one of our standard indicators or download one from our library. Choose your own custom Chart Theme. - Account : The accounts folder will list all your accounts (both demo and live). To add a new account simply right-click the folder and choose Open a New Account. It is important to be aware of which account you are currently trading. 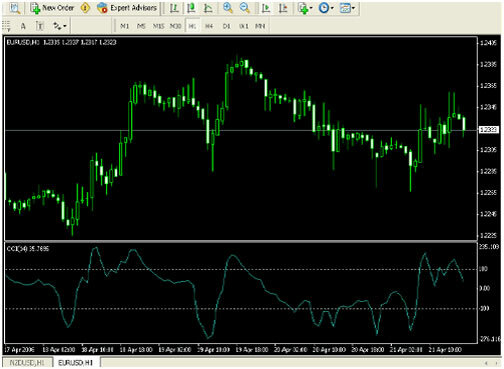 - Indicators : this will list the indicators that come standard with the Interbank FX Trader platform. If you double-click an indicator you will add it to the current chart. - Expert Advisors : Your available CapFX/advice systems. Double-clicking an advisor will activate it for the current chart. - Custom Indicators : Very similar to the Indicators folder, however this folder will hold all of your custom indicators as well as the library of indicators that we supply on our forum. - Scripts : Scripts are programs destined for single execution of a given action. 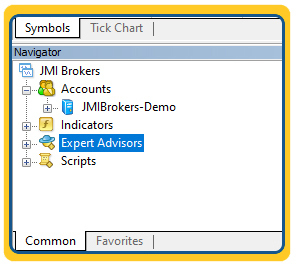 Unlike Expert Advisors, Scripts aren't fun tickwise and have no access to indicator functions. The Trade Terminal allows you to make trades and control your open positions in real-time. You can activate it through the menu opens View > Terminal or by pressing the Ctrl + T key combination. You can also use the Trade Terminal button on your toolbar. The Trade Terminal can be positioned anywhere on the screen. To move it, click the title bar and hold the left mouse button down to drag the window to where you want it. Active currency positions are listed in the Trade tab window. Positions are managed through a context menu. To view the context menu's options right-click on any position. - Trailing Stop : you can select a predefined trailing stop or set up a custom one. - Grid : show and hide the grid to separate the columns. 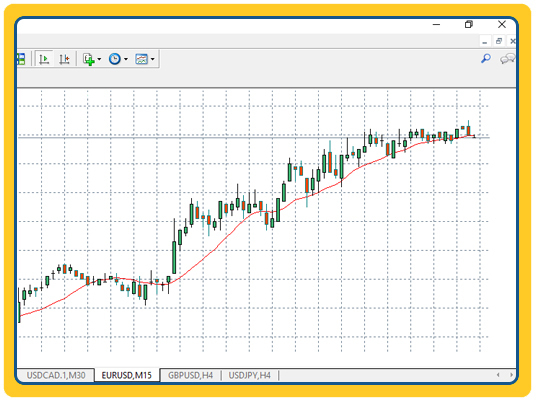 - By double-clicking a currency pair in your Market Watch window. The Order Form window appears and you can open a position or place an order. 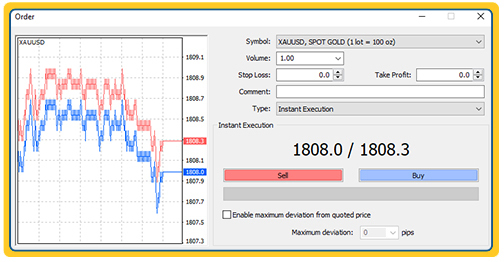 The order window will ask you to select a security symbol (Symbol), specify the number of lots (Volume), set up an optional Stop Loss (Stop Loss), set up an optional Take Profit (Take Profit), and select your order type (Instant Execution or Pending Order). You can then either click the Sell or Buy button to execute your order. A common mistake among traders is to rely upon a trailing stop as if it were a stop loss. It is important to remember that a trailing stop is not triggered until a trade is positive the amount of pips the trailing stop was set for (+ 1). In other words, a trailing stop set for 15 pips does not become your stop loss until the market has gone at least 16 pips in your favor. If the market were to immediately trend against your position you would have no protection in the form of a stop loss. - How does a trailing stop work? Trailing stops are designed to lock in profit levels. Trailing stops literally trail along your increasing profit and adjust your stop loss levels accordingly. A trailing stop set for 15 pips will trigger once a trader's position is positive at least 16 pips. From this level the trailing stop will adjust pip for pip as your profit level continues to increase. A trader whose trailing stop is set to 15 pips and who is positive 20 pips has protected at least 5 pips of profit. As this trader's position increases so will their protected profit level. - Does my computer need to be on for the trailing stop to work?